PeStudio Portable is a free tool performing the static investigation of any Windows executable binary. 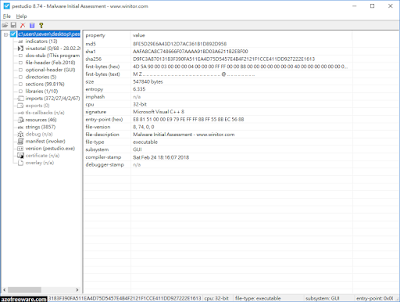 A file being analyzed with PeStudio is never launched. Therefore you can evaluate unknown executable and even malware with no risk. PeStudio runs on any Windows Platform and is fully portable, no installation is required. PeStudio does not change the system or leaves anything behind.